Fancy Gap is a steep mountain grade located in the Appalachian Mountains of Virginia on Interstate 77, approximately 7 miles north of the Virginia/North Carolina state line. 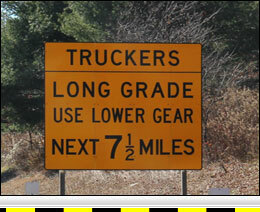 Interstate 77, at this location, consist of a steep southbound descent and rolling hills with no significant grades going northbound. 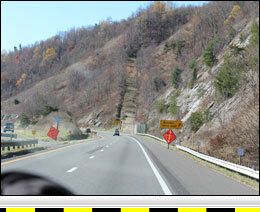 Southbound Interstate 77 from the Fancy Gap has a vertical descent of 1,289 ft. over 6.2 miles. The southbound descent has three runaway truck ramps at 0.8 miles, 2.4 miles and 4.6 miles south of the summit. The first part of this grade is moderately steep but becomes more aggressive about halfway down. The calculated average grade for the southbound descent is 3.9%. However, for the last four miles this grade is closer to 5% and has a calculated average grade of 4.5%.